Every issue from pollution to habitat to biodiversity and beyond has a geographic component, and thus can be studied in the field. Because the world is rapidly changing, and because large organizations have cut back on many of their field staffs, much of the critically needed field data can and should come from citizen scientists. Consider the major environmental issues of our 21st Century world: Coastal erosion, air, soil, and water pollution, urbanization, desertification, habitat loss, invasive species, and deforestation, just to name a few. Each of these issues occurs somewhere, and often in multiple locations and at multiple scales. For example, climate change is a global phenomenon that also impacts local weather and crop yields. Each phenomenon exhibits a spatial pattern in its source and in its diffusion. Each affects multiple facets of the human and physical environment. Therefore, the geographic perspective is key to understanding those issues, and citizen science initiatives provide data that can be used within a GIS environment. In such an environment, multiple variables can be displayed and analyzed as map and image layers, at multiple scales, in two dimensions and in three dimensions. Educators collecting data on invasive weeds in a field in Iowa. Those who use GIS in tandem with field-collected data through citizen science initiatives develop key critical thinking skills. These skills include understanding how to carefully evaluate and use data. This is especially critical in assessing environmental data, due to its increasing volume and diversity, and given its often sensitive and politically-charged nature. In addition, crowdsourced data is appearing from citizen science initiatives all over the world on subjects such as pine beetle infestation, the appearance of monarch butterflies in their community each spring, the date of the first frost, and a host of others. These data are more frequently being tied to real-world coordinates, mapped, and analyzed. Students and others using GIS who are grounded in environmental studies will be in demand to help make sense of this deluge of incoming data. Fieldwork has such a long and rich history within earth and environmental studies that it is almost like stating the obvious. However, in a world where outdoor education is often cut due to budgetary constraints, and when a frighteningly large proportion of the population has almost no connection with the outdoors, it bears emphasizing. In earth and environmental studies, the “offices” of many educators actually are in the field—in nature centers, museums, parks, and wildlife reserves. 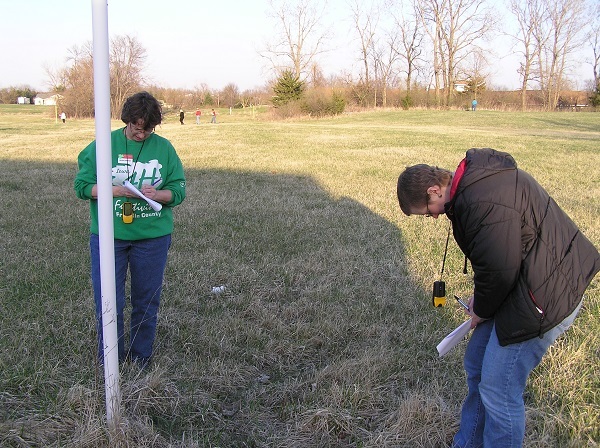 In the field, students can collect data on a myriad of phenomena, such as tree species, water quality, weather, soil chemistry, and more. In so doing, they gain a better understanding of processes, scale, and the environment in a way that they might not be able to do in the classroom. They can sketch, record video, take photographs, or simply use their five senses. Beyond data collection, they develop an appreciation for the balance of nature, or the “unbalance,” depending on where they are, and the connectedness of the hydrosphere, atmosphere, lithosphere, and biosphere. Studies show that if students do not receive repeated and deep immersion in natural places while young, they will not value nor appreciate natural places nor their associated environmental processes or issues as adult decision-makers. Given the widespread environmental concerns faced by the modern world, it is imperative that the general public study and understand about these issues–not only to equip them for life in the 21st century, but to ensure that we emerge at the end of the 21st century in a sustainable way. How can we expect decision-makers to care about the planet unless they have learned about the planet while out in the field? Citizen science is one way of engaging the mind and all of the senses while taking part in important research that benefits people and the planet. So can citizen science-gathered data be used within ArcGIS Online? Every electronic piece of information in our world, whether photographs, text, sketches, videos, or web links, are increasingly geolocatable, with a latitude-longitude coordinate pair, or with an ordinary street address. Thus, they can be mapped. These geocoded data can be added as multimedia map notes in ArcGIS Online. Because these web maps are created in the cloud, they can be saved, shared, embedded in web pages, and used in a myriad of other ways. 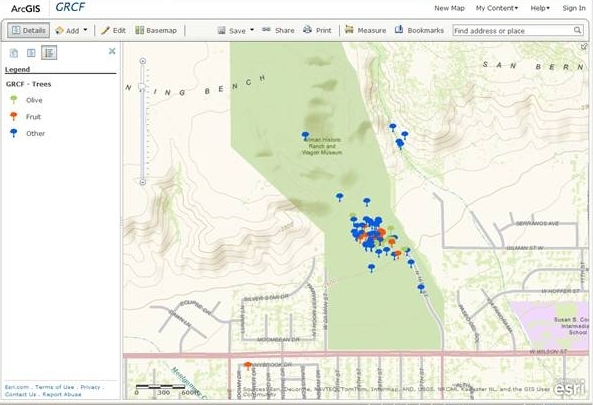 Web map in ArcGIS Online for a historical ranch in southern California, created from data collected in the field by citizen scientists. These same sorts of multimedia can be published as “story maps” via http://storymaps.esri.com and become a new platform for explaining a specific topic from local scale (such as land use change in a city), to regional scale (such as coastal erosion), to global scale (such as invasive plant species). In addition, data can be simultaneously gathered using the ArcGIS Collector or Explorer apps on a smartphone, and automatically populate a continuously updating ArcGIS Online map. Setting up such a map is shown here https://www.youtube.com/watch?v=8qciLuWwgZo), and collecting data in the field is shown here https://www.youtube.com/watch?v=C6dNfeQkTGo. GIS has already proven to be invaluable for scientific research and understanding, but now there are a number of opportunities for citizen scientists to leverage geospatial technologies in their quest for knowledge and entertainment, and still make valuable contributions to society. If properly structured and managed, the integration of citizen science and GIS will enrich geospatial infrastructure, giving GIS practitioners new types of data to use, manage, interpret, and incorporate into their work. More importantly, it could significantly advance our understanding of the planet.